Today I'd like to show you two cards I received in the mail last Christmas. I call them keepers, as they're so special they definitely aren't going into the pile to be cut up as gift tags! This one is a quilled card that isn't really quilled. Well, let me clarify that... there was an original quilled version of course, but my Australian friend, Licia Politis, photographed her modern disc wreath and adhered the glossy picture to a card blank. What a time saver this is when you need to send a lot of cards. It's also much lighter to mail and no bubble wrap required! I love the fresh colors too, which are a nice play on traditional Christmas-y red and green. Here's a variation of the same idea that Licia shared with me. Silvery metallic and dots, dots, and even more dots on the ribbon - so pretty. Allow me to branch out just a bit to show you what just might be the most beautiful cookies ever - seriously, almost too pretty to eat! I saw these on Cake Wrecks one Sunday when baked disasters are replaced with truly wonderful goods. (You read Cake Wrecks, right? It's hilarious.) These are gingerbread cookies from Whipped Bakeshop in Philly, with a design of scrolls and flourishes that's calling out to be replicated in rolled paper. 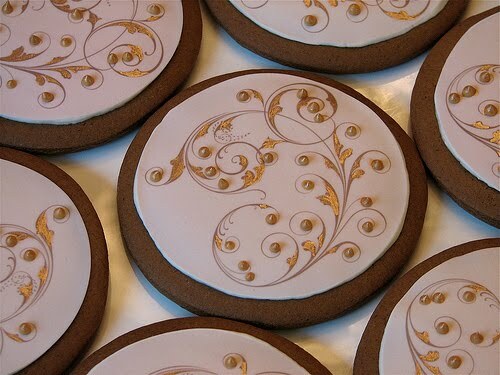 People sometimes ask where I get inspiration for quilled designs... from now on I can add cookies to the list! I LOVE, LOVE, LOVE the paper cut Christmas card. Wow! And there's no way I could eat those cookies. They are way too pretty! Very nice creations! I really like them!! What great cards. I especially like the paper cut one. That is just beautiful. I can't believe those are cookies. I've never seen a cookie so pretty. Wow! Thank you so much for sharing some lovely art with us today. I especially love the papercut card and the gingerbread cookies. How did they do that? So pretty, everything! Such pretty cards! I liked both. Licia is an extraordinary quiller.I am sure you will be great at paper cutting too Ann. The paper cut card is simply lovely - such intricate detailing! Must have taken simply hours if it was done by hand. All the best in your paper cutting endeavors! Such pretty things! I love paper cutting.. The cookies are truly amazing! You have been featuring some really cool stuff lately, I definitely have some catching up to do! I've used photo cards with a picture of my quilling for the past three years and this year makes four. It's definitely a time saver and everyone still gets to enjoy a bit of quilling. Thanks Ann for the feature and I appreciate the comments left by fellow artisans. To Suganthi, I especially like your use of the vortex coils as featured on your blog...the petals are so even and vortex in beautifully!!! I love 'em!! !